Merseyside Recycling and Waste Authority (MRWA) – which owns 14 household waste recycling centres across the whole of the region – says thousands of Liverpool householders are needlessly trekking across the city to Otterspool – the city’s only Household Waste Recycling Centre (HWRC) – instead of visiting Centres much closer to home. More than 10,000 householders visit the Otterspool HWRC in Jericho Lane, Aigburth, each month, with thousands of Liverpool residents travelling from the north and eastern fringes when they could be visiting more local centres in South Sefton, Kirkby or Huyton. MRWA Chief Executive Carl Beer said: “Everyday we get dozens of people turning up at Otterspool from all corners of the city when they could have saved time, energy and have given themselves a much shorter journey by travelling to Household Waste Recycling Centres across the border in Sefton and Knowsley. The Authority is now mounting a ‘Recycling is Closer than You Think’ advertising campaign and will be leafleting more than 25,000 Liverpool homes in key postcodes, and running advertising campaigns to get the message across to householders in the northern and eastern fringes of the city. Leaflets give directions to three Household Waste Recycling Centres in Kirkby, South Sefton and Huyton, which the Authority believes will be better locations than Otterspool for many recyclers. Paul Smyth, Contract Manager for Veolia Environmental Services, said: “Veolia operate the 14 Household Waste Recycling Centres in Merseyside, our operatives will be available to provide assistance and answer any queries regarding the locations of other Recycling Centres”. 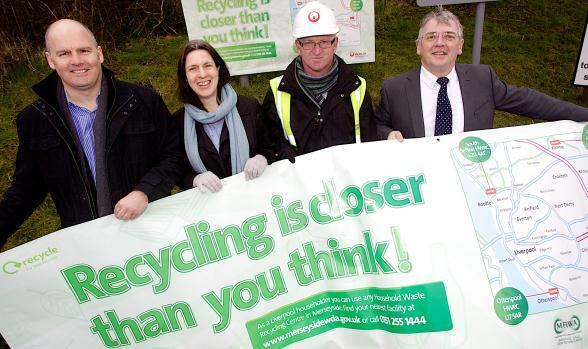 Landscape picture: Left to right – Carl Beer, Chief Executive of Merseyside Recycling and Waste Authority launches the ‘Recycling is closer than you think’ campaign with Cllr Laura Robertson-Collins from Liverpool City Council and Gerry Boyle and Paul Smyth from Veolia Environmental Services. 2. Liverpool residents can also use HWRCs at: Southport PR9 7RG; Formby L37 8EG; Rainford WA11 8EY; Bidston CH41 1EB; West Kirkby CH48 5HR,Clatterbridge CH63 4JZ; Sefton Meadows; L31 8BX; Rainhill L35 4NX; Ravenhead WA9 5EA; Newton-le-Willows WA12 8DN.